A good chambray shirt is an extremely versatile piece that easily earns itself a place as a closet staple. Chambray shirts can be worn during any season which makes them a great transition piece and a key element for layering. Chambray pairs well with almost any color and pattern (seriously, can you think of one it doesn't look good with?). I would even recommend having a dark and a light wash chambray. I have rounded up some stylish for less options all under $50, including this one that is only $12. Love these shirts and the price are amazing! i am in need of new chambray for this year!! I love a good Chambray top! I have two and wear them all the time! 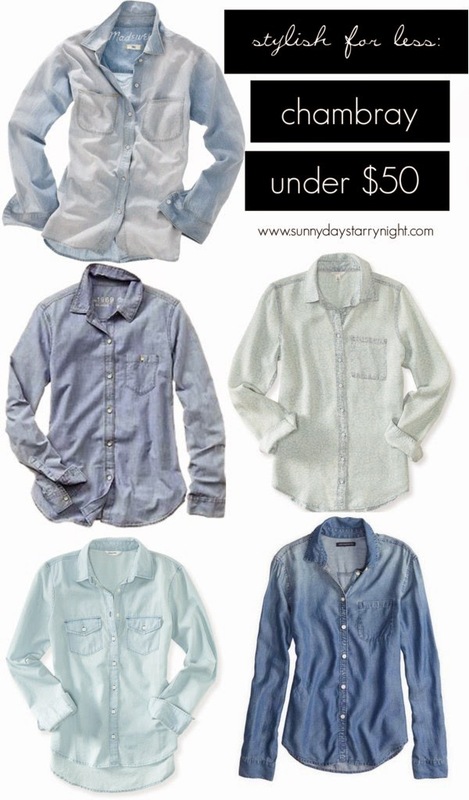 I love chambray- and I love a good steal! :) Great post! I love my chambray shirt! It is such a closet workhorse, and somehow manages to get dressed up or down effortlessly. Oh these are all great. I got a chambray shirt for free because the editors at my old job went to a sample sale whooee. So cool and effortlessly chic! The dark wash is my fave! Happy Friday girls! i still haven't found the right ones. they are either too oversized or too thick and hot! You can never go wrong with a great chambray shirt. Old Navy has some great ones to. I love a good chambray shirt. I have a truly tacky one from forever 21 that has an America Flag acid-washed into. It has pearl snaps lol. It's what I wear to country music shows.